N.W.O. 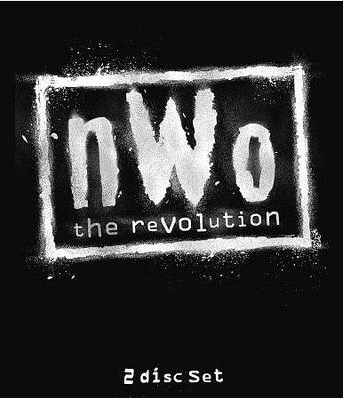 The Revolution is a documentary focusing on one of the biggest and greatest staples in the history of professional wraslin', the N.W.O. AKA The New World Order. This feature mostly highlights 1996 and 1997 which were the best years though they do touch on 1999 and 2002 for just a smidgen which weren't the best of days to be a fan of that team as they sucked. Some of the people they booked as guests for this feature really had nothing to do with them other than watch them on TV back in the day (like Cody Rhodes and Matt Striker) and funny enough I have no problem with it as it added a little charm. 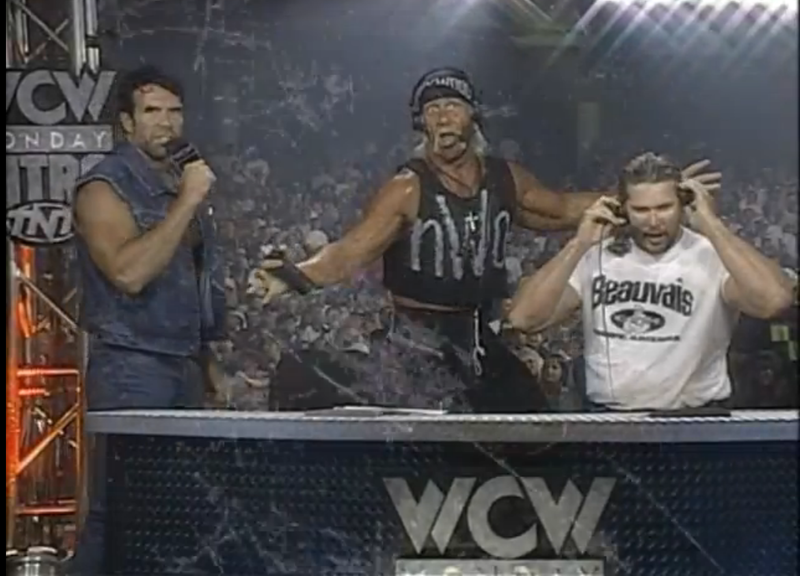 Some of the guests they have that were involved in this team was unexpected, I sure as hell didn't expect to see Lex Luger or Vince Russo to make an appearance in this program. The rest of the guests are people you would expect but some of them like Scott Hall and Eric Bischoff were just recycled footage from older releases like “Monday Night Wars” and “N.W.O. Back In black”. Overall the feature was OK, nothing terrible but it does feel a little empty. The beginning was a little slow but picked up in the middle only to slow down again towards the end but was still very watchable. [Click "Read More" for rest of article]. If you're anything like me then you didn't buy this for the documentary but for the truckload of special features and by truckload I mean a whopping eight hours of them. Ranging from classic matches to not so classic matches and some really great promos (the outsiders debut to WCW is a good example of how brilliant wrestling promos could be). A minor problem I do have is that I would of loved to have seen these segments play in chronological order. Well I say minor as it does do that for the most part but occasionally it would play a clip from let's say “2002” then it'll go back to the year “1997”. So why not just put that “2002” clip in the “2002” section? Another thing I did like was that the old WWF logo was uncensored giving an extra dose of nostalgia up our nostalgia rectums. If you felt that the main feature didn't go deep enough into talking about the N.W.O. (cause it was pretty shallow) then you should enjoy the features that are exclusive to the blu ray version which is an episode of Legends of Wrestling (hosted by “Mean” Gene Oakerland, Jim Ross, Michael Hayes and Kevin Nash) where they get into more depth of the backstage antics of creating this (in)famous storyline and I must say that it was much more enjoyable than the main feature was. That's not all, the blu ray version also has 30 minutes of the public service announcement promos which are absolutely classic and were fun to watch. Overall the documentary was a bit shallow but the special features is what makes this release a good watch. I recommend it to all our wrasslin' fans out there. That's not fog that's behind good old Hulk Hogan. Like what I did with the review for ECW Unreleased Vol.1, I'm going to put the list of matches right here at the end of the review. All of these promos and wrestling matches appear in the special features and can be found on both the DVD and Blu Ray versions. 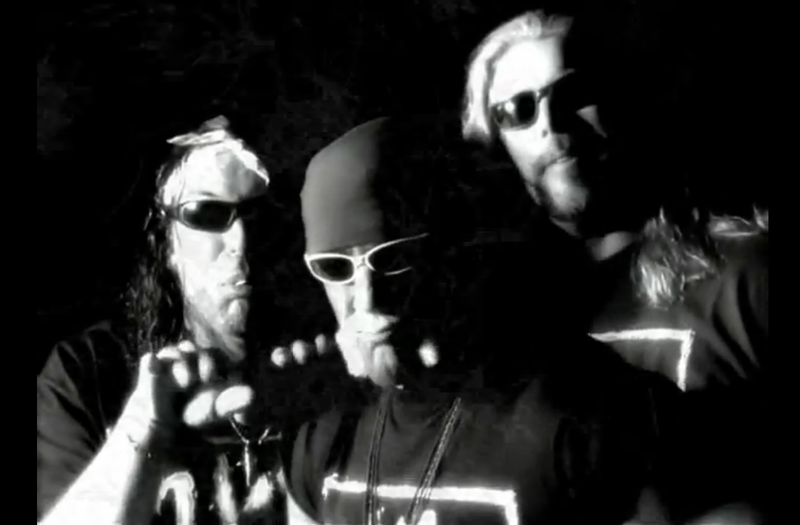 The NWO are just simply 2 Sweeeeeeeeeet! Hell yeah, I've been waiting for this review, excellent stuff Kaiser! I had heard that the documentary was kind of weak, but then again we all know the story by this point. The matches and promos make it sounds pretty worth it, plus its hard for me not to mark out over the white and black, brother! 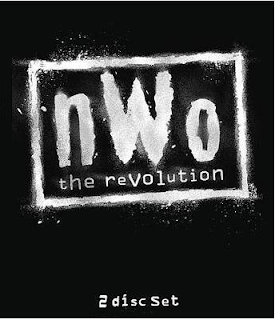 Since there has been nWo Hollywood, nWo Wolfpack, and nWo 2000. 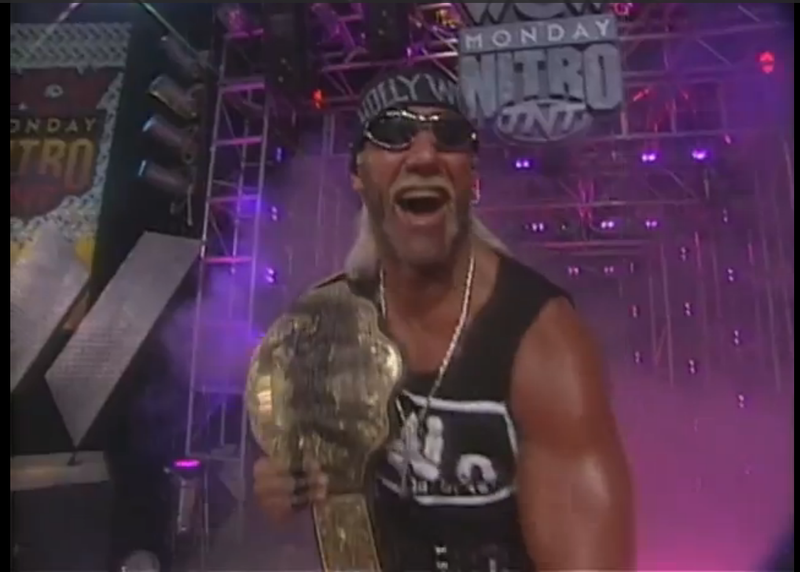 Perhaps we can start the "nWo Mondo Cool" with me as Hollywood Hogan,you as Kevin Nash, and perhaps get the Gameing Beast as Scott Hall? That's one more for da good guys! Yeah I used to have the exact same Outsiders shirt that Queer Chaser Timmy wears in the intro. It makes me hate everything.